‘White Sugar Cube Book’ is designed as a concise reference guide of the Frieze Art Fair 2008. Realized by Didem Özbek as a conceptual art project with the editorial support of Frieze Art Fair's Yearbook 2008-9 contributors, 240 copies of this limited edition book have been produced. It includes clues on the work of the 240 artists represented by the galleries participating in Frieze Art Fair 2008. Outside of the familiar format of a standard book, all of the pages of this book have been printed on the wrapping paper of white sugar cubes. Throughout the four days of visual bombardment during the fair, the clues about the artist's work on the sugar cubes will perform as an orientation tool for the tens of thousands of visitors around the fair. For those desiring the pleasure of being a collector amidst works worth hundreds of thousands of dollars, the ‘White Sugar Cube Book’ will act as a collector's item. Similar to one of our first, most delightful childhood collections, such as comic bubble gum wrapper collections, this project will provide the opportunity of not leaving Frieze empty handed, but instead with an affordable piece of art work. 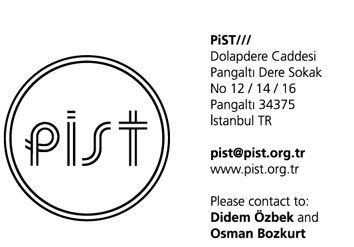 Didem Özbek is an artist, designer and co-director of PiST/// Interdisciplinary Project Space – a non-profit, independent, artist-run space – in Istanbul. This project aims to carry PiST's familiar daily life in Istanbul to London. Taking inspiration from the neighbourhood tea stand, which acts as a gatekeeper while providing tea service to the whole street and sharing views and thoughts amongst workers and neighbours, PiST aims to be the gate keeper for the neighbouring galleries. Özbek takes this model of communication to Frieze, to create a communication network amongst the world's leading galleries and artists. Produced as a part of the tea stand installation of PiST at Stand F36, Turkish tea's ubiquitous companion, white sugar cubes work as a metaphor of the white cube gallery spaces of the art market, becoming a – sweet – guide for the viewers of the show.